This is your typical bungalow house, with lots of room, entry door directly into the living room and lots and lots of light and air. The whole front side of the house is built out of glass, letting light coming in. More than just a bungalow, the sense of style is evident in every room. 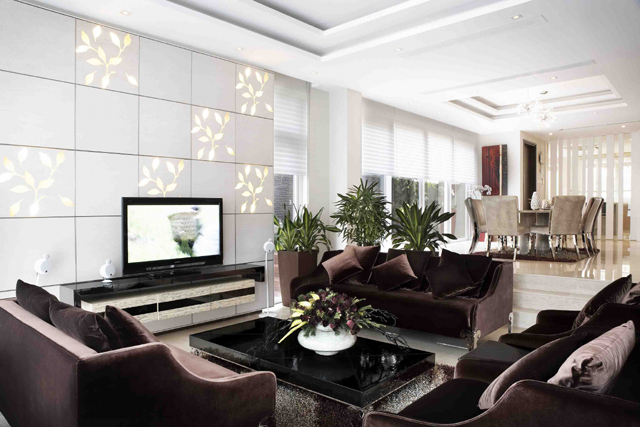 Let’s start with the living room, where flower art on the wall mimics the actual flowers in the room. Interesting, not ordinary and definitely not your every day solution. Flowers are the signature line of the whole house, with real flowers on every balcony and terrace, some artificial flowers in the bathroom, and flowers as an inspiration for lighting and chandeliers. While the living room is crowded with furniture, it is all about space in the bedrooms. Step into the kitchen and you notice how the minimalistic trend continues here. Appliances are incorporated into the design, to save up space. Even though the house is large and spacious, glass and mirrors are used in most of the rooms to provide even more spacious feeling. For example in the bedroom and bathroom.